What do SAMURAI WARRIORS, LEMONS, SPATULAS and BUGS have to do with SOUND? SONIC PLAYGROUND concocts new musical ideas prepared especially for families and children of all ages. 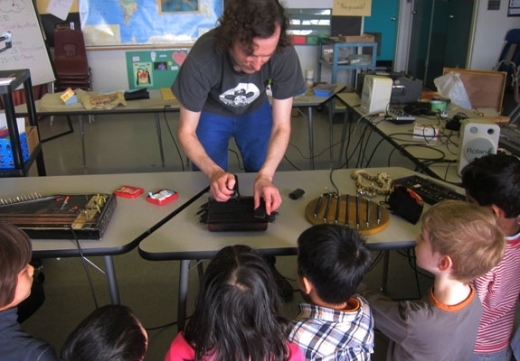 Vancouverʼs most creative musicians and sound artists take audiences on unusual journeys through story telling, creative cooking and of course making music! Back by popular demand SONIC PLAYGROUND features sound installation highlights from the successful Sonic Playground tent of the 2008 Vancouver International Childrenʼs Festival. New to this year, is Diana Burgoyneʼs electronic folk art piece Audio Bug and the Rimba House by Brad Muirhead and Martin Fisk built with students from the Roundhouse Community Centre after school program. Musical performances allow for creative listening and participation. 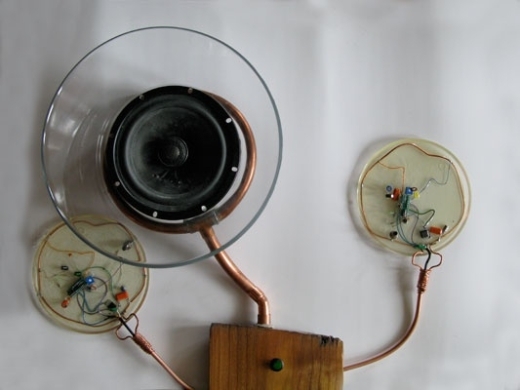 Learn how to conduct with Stefan Smulovitzʼs Mad Scientist Machine and explore amplifying household objects with Lee Hutzulak and Madoka Haraʼs performance ofContactopus. Listen to the story of Atsumori about honorable warriors by Alcvin Ramos and Kirk Watson. Make lemonade with Jennifer Butlerʼs Knick Knack Lemonwhack, a percussion tour-de-force for kitchen utensils and experimental recipes. Also come and listen to the work of: Frederick Brummer, Vern Griffiths, Viviane Houle, Coat Cooke, Lori Freedman, Odette LeBlanc, Brian Nesselroad and more. Inviting curious fingers, eyes, and ears to explore the sound possibilities of some very unusual “instruments”. throughout the day, allowing everyone to get involved and make some surprising sounds. taking brave wanderers around the Roundhouse Community Centre site to explore the surrounding environment using their ears as their guides. Sonic Playground is an initiative developed by Western Front New Music in conjunction with Sonic Presence: Vancouverʼs contemporary new music community including Vancouver New Music, Music on Main, Forbidden Flutes and the New Orchestra Workshop Society.